JJRC H47 Review : What this upgraded popular selfie drone has to offer ? Continuing on with our series of miniature drone reviews, today we’re putting JJRC H47 to the test. 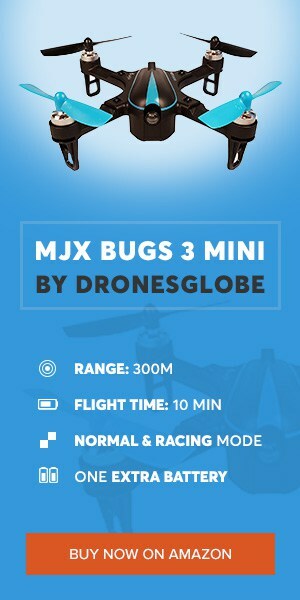 Those of you who follow the website will know that so far we covered about 7 of these mini drones. In fact, those of you who follow the website will probably notice that there’s a lot of similarities between JJRC H47 and Eachine E56. Not only that these two are similar, they are actually identical. H47 is a rebrand of E56, or E56 is a rebrand of H47. I’m not sure who “borrowed” from who in this situation. Today we will do a JJRC H47 review ! 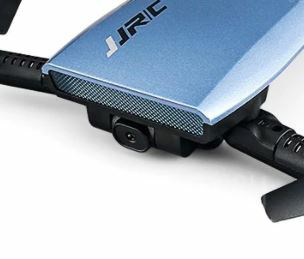 JJRC H47 is cheap, ultra portable drone that can be used by novice drone pilots to get familiar with quadcopters or selfie lovers because the camera is actually quite decent on H47. Remember that in my review of E57 I had problems with drone disconnecting from the transmitter and doing emergency landings on his own. On top of that the camera quality wasn’t that great. H47 doesn’t have the same issues, they at least aren’t as pronounced, which leads me to believe that JJRC made some tweaks to the drone internals. It is not a copy/paste type of rebrand. Appearance wise JJRC H47 is identical to Eachine E56. 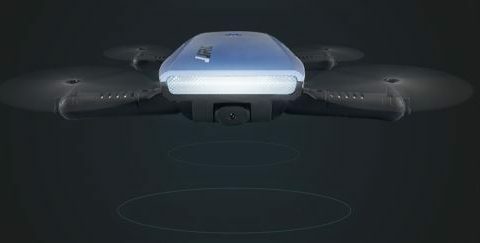 It has the same rectangular bulky main body design and drone blades that can be completely tucked away by folding them underneath the drone body. Dimensions of the drone when unfolded are quite small, 18cm wide, 18cm long and just 3.2cm high. Drone feels solid in hands. What I mean by that is that the plastic covers aren’t rattling around or making squeaking sounds when the drone is held in hands. When the drone is folded, its dimensions change dramatically. Drone width takes the biggest hit. It goes from 18cm, to just 7cm. Length is decreased to about 15cm and height stays the same, 3.2cm. When folding and unfolding the drone, blade arms have to click in place. That is their locking mechanism, and if you don’t extend them all the way out, blades might get stuck and damaged. What makes JJRC H47 review interesting? 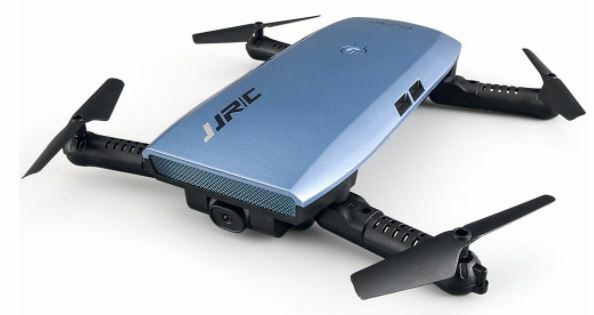 JJRC H47 drone uses a 720p camera sensor which offers good quality video and even better looking photos. In my Eachine E56 review I was a bit disappointed with the camera. Not only that the video was a bit grainy, but while in FPV mode, there was a noticable lag in the connection so the video recording would stop and resume every now and then. On JJRC H47 there weren’t any kind of problems with the camera. Video quality is good for such a cheap drone and a 720p sensor. Lag is non-existent. 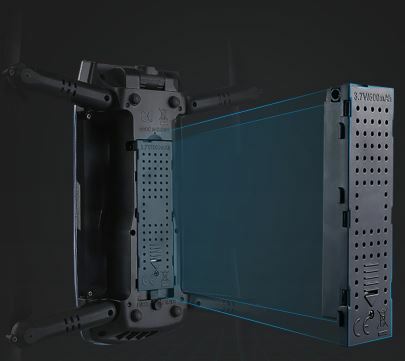 Video feed in FPV mode and recordings made with the drone are fluid, without dropped frames. JJRC must have switched out the camera sensor or wifi antenna or both. At the very least they probably made some optimizations so that everything works properly. 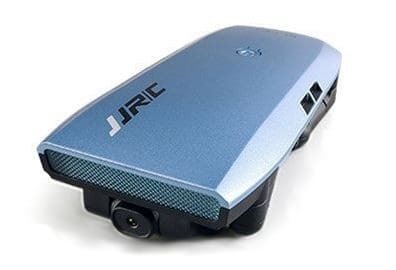 A smartphone or a tablet, with the “JJRC App” installed (iOS and Android), is necessary to record video or take photos. Drone doesn’t have a microSD slot, so the app is used for saving both video and pictures. Camera quality is best experienced with a sample video. Here it is down below, hit play and you should see what kind of camera quality can be expected from H47. 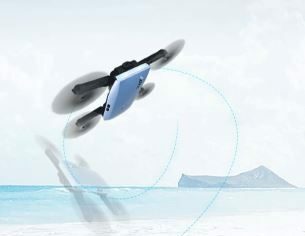 There’s no noticeable lag, video runs smoothly even when doing sudden movements with the drone, like turns, pitch changes, rolls, tricks, etc. I doubt that the camera pixel count goes over 1MP. Still the video looks better than on Eachine E56. Video brightness is all over the place and colors don’t look that great, but I think that asking for perfection from a ~$55 drone is a bit too much. For me the very fact that the video feed is stable, without lagging or dropped frames, is a miracle to be honest. Now if you ask me about the range, that is something that could have been better. I mean the 150ft range that the FPV signal has is standard for these 2.4Ghz wifi drones, I’m not singling H47 out. Even still feels very limiting. Maybe future models will implement better radios for better range. 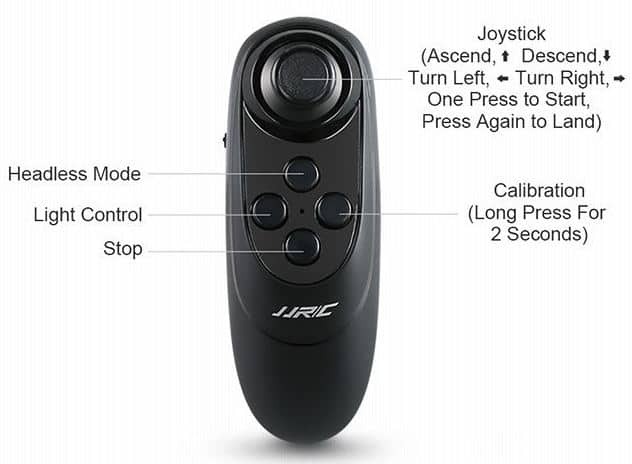 JJRC H47 drone has an unusual transmitter. Single handed g-sensor powered transmitter isn’t something that you normally see on drones. Drones that have unusual transmitters, or no transmitters at all, like it is the case with JJRC H43WH, is a relatively recent trend. I wouldn’t necessarily call it a bad thing. It’s just innovation, trying new things. Figuring out the g-sensor controls didn’t take long. Check out the cheat sheet on the right for a quick visual “how to” of the g-sensor controls. One joystick does exist on the transmitter. It is used for throttle (going up/down), and for changing yaw (rotating the drone left/right). 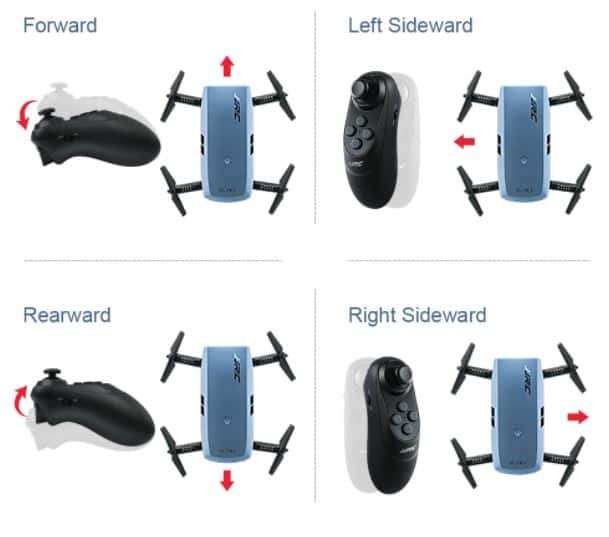 G-sensor controls are used for changing the drone pitch (moving forward, backwards), and also for adjusting roll (moving the drone sideways left/right). Reading about g-sensor powered control might make you think it’s complicated, but it really isn’t. As soon as you grab the controller in your hand tilting it in order to control the drone becomes instinctive. It is a very intuitive way of controlling the drone. You might have actually controlled a drone using a g-sensor if you ever used app control on a drone. 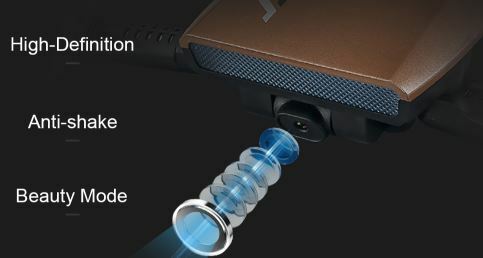 They sometimes include g-sensor control, only in their case phones g-sensor is used for controlling the drone. H47 and Eachine E56 have the g-sensor in their controller. To sum up, transmitter works well, is very responsive and it will be an excellent conversation starter. Let’s take a look at what kind of additional features JJRC H47 has to offer. Headless mode is available. I have to say that it works great in combination with the g-sensor controller. In headless mode you don’t have to adjust yaw, just tilt transmitter to change pitch/roll and enjoy the ride. Altitude hold uses a barometer to hold up the drone at a set height, without you having to fiddle with the throttle. Camera has a beauty mode, but I don’t notice that much of a difference with it active, to be honest. 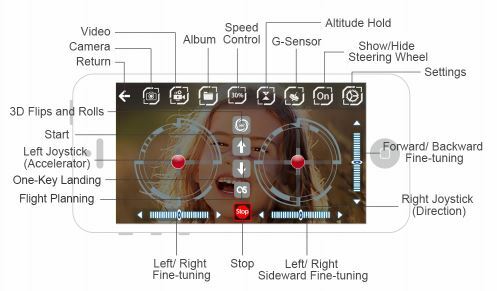 Within the FPV app control you’ll find lots of buttons to tap. Two other that I think that are worth a mention would be one-key landing button and 3D flips and rolls button. One key landing obviously automatically lands the drone for you, so you don’t have to go through the hassle of landing it yourself. Tricks work great, and are a lot of fun. Lastly there’s also flight planning, speed control and gyro stabilization (one button calibration on the transmitter). While flying the drone with both the g-sensor powered transmitter and the app control, everything went OK. Some battery overpowering is present. When you push the motors too hard drone will lose altitude, but it’s nowhere near to the kind of extent that it was happening on Eachine E57. G-sensor transmitter might not be as responsive as a joystick would be, but when you take its price into account, H47 offers a very pleasurable flying experience. JJRC H26W is new WiFi drone, it’s very affordable and video & image quality is pretty good.